The Davis-Bacon Poster (Spanish) is a minimum wage law poster by the Federal Department Of Labor. This poster is mandatory for some employers, including employers who are contractors/subcontractors engaged in contracts of excess of $2,000 for anything building or modifying a building financed partially or fully from the federal government.. This Spanish version of a poster must be posted in a conspicuous place for employers of those who are contracted for any labor intensive or mechanical job. 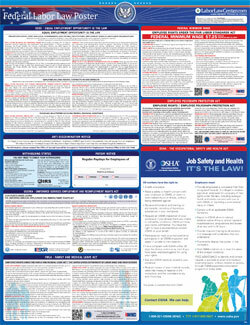 This poster describes the prevailing wage (lowest a worker can be paid), requirements for overtime pay, penalties to contractors should they violate this law, how to deal with apprentice rates, and how to contact the correct departments if you are not receiving the pay you should or want to make sure you are getting paid the correct amount. It appears you don't have a PDF plugin for this browser. Please see the link below to download federal-davispan.pdf. Davis-Bacon	fijada	con	este	Aviso	para	el	trabajo	que	Ud. desempeña. programas	federales	o	estatales	aprobados.